Map of Belgian regions and provinces. To get the total area of Belgium, the surface of the Brussels-Capital Region should be added to the list, since Brussels is not in any Belgian province anymore since the province of Brabant has been split. Belgium has also 3,462 square kilometers of sea territories in the North Sea. On 29 May 2000, 2,000 square meters were granted by the Netherlands to Belgium (a piece of land in Zelzate along the Ghent–Terneuzen Canal). Compared to other countries, Belgium is 44% larger than Wales in the United Kingdom and about the size of Maryland in the United States. Belgium is actually used as an unusual unit of measurement in comparing country sizes. In November 2016, Belgium and the Netherlands agreed to cede small, uninhabited parcels of land to reflect a change in course of the river Meuse (or Maas, in Dutch). The land swap is to take effect as of 2018. 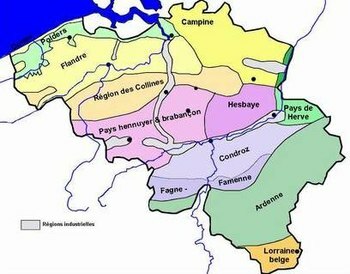 The natural regions of Belgium. 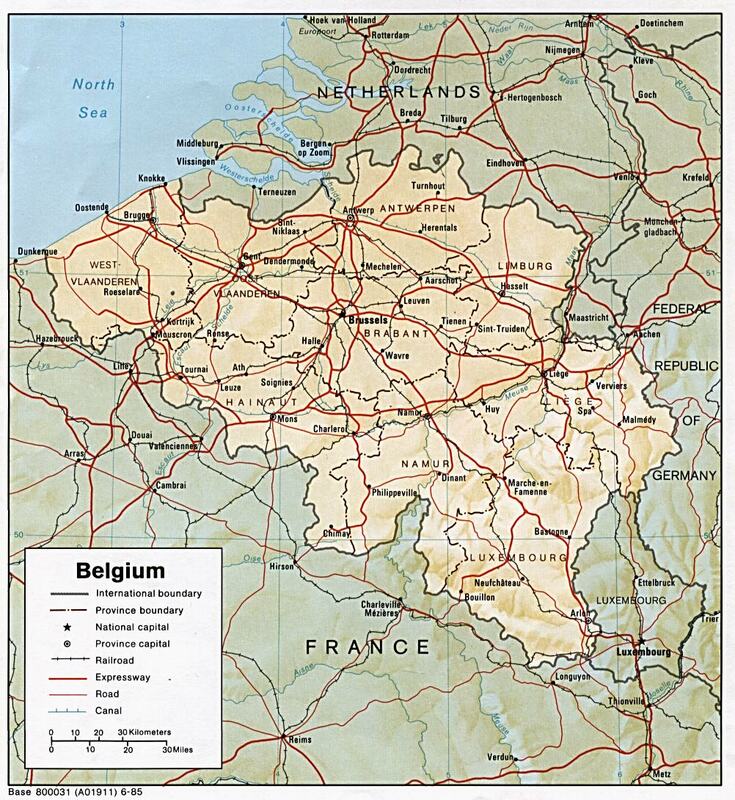 Belgium has three main geographical regions: the coastal plain in the north-west, the central plateau, and the Ardennes uplands in the south-east. The coastal plain consists mainly of sand dunes and polders. Polders are areas of land, close to or below sea level that have been reclaimed from the sea, from which they are protected by dikes or, further inland, by fields that have been drained with canals. The second geographical region, the central plateau, lies further inland. This is a smooth, slowly rising area that has many fertile valleys and is irrigated by many waterways. Here one can also find rougher land, including caves and small gorges. The third geographical region, called the Ardennes, is more rugged than the first two. It is a thickly forested plateau, very rocky and not very good for farming, which extends into northern France and in Germany where it is named Eifel. This is where much of Belgium's wildlife can be found. Belgium's highest point, the Signal de Botrange is located in this region at only 694 metres (2,277 ft). Belgium has relatively few natural lakes and none of any great size. Notable natural regions include the Ardennes, Campine and High Fens. All of Belgium is drained into the North Sea, except the municipality of Momignies (Macquenoise), which is drained by the Oise river into the English Channel. Three major rivers flow into the sea: the Scheldt (200 km in Belgium, 350 km in total), the Meuse (183 km in Belgium, 925 km in total) and the Yser (50 km in Belgium, 78 km in total). Other rivers are the Rupel, Senne, Sambre, Lesse, Ourthe, Lys and Dijle. The main lakes include the Lake Genval, Lake Bütgenbach, Lake Eau d'Heure, Lake Gileppe, Lake Eupen and Lake Robertville. Belgium has also many artificial waterways or canals, among others the Brussels–Scheldt Maritime Canal, the Brussels–Charleroi Canal, the Canal du Centre and the Albert Canal. The Belgian climate, like most of northwest Europe, is maritime temperate, with significant precipitation in all seasons (Köppen climate classification: Cfb; the average temperature is 3 °C (37.4 °F) in January, and 18 °C (64.4 °F) in July; the average precipitation is 65 mm (2.6 in) in January, and 78 mm (3.1 in) in July). Belgium usually has cool winters but temperatures as low as -16 °C (3 °F) have been registered and summers are comfortably warm but temperatures can occasionally rise as high as 30 °C (86 °F). Belgium's highest point is the Signal de Botrange at 694 metres above the sea level. Other hills in Belgium include the Kemmelberg (159 m high) and the Koppenberg (77 m high) both known as part of the route of the cycle races Gent–Wevelgem and the Tour of Flanders respectively. This is a list of the extreme points of Belgium, the points that are farther north, south, east, west, high or low than any other location. The Belgian National Geographic Institute calculated that the central point of Belgium lies at coordinates 50°38′28″N 4°40′05″E﻿ / ﻿50.64111°N 4.66806°E﻿ / 50.64111; 4.66806, in Nil-Saint-Vincent-Saint-Martin in the municipality of Walhain. As of 2007, the estimated area of irrigated land was of 233.5 km². Because of its high population density and location in the center of Western Europe, Belgium faces serious environmental problems. A 2003 report suggested that the water in Belgium's rivers was of the lowest quality in Europe, and bottom of the 122 countries studied. The environment is exposed to intense pressures from human activities: urbanization, dense transportation network, industry, extensive animal breeding, and crop cultivation; air and water pollution also have repercussions for neighboring countries; uncertainties regarding federal and regional responsibilities (now resolved) have slowed progress in tackling environmental challenges. The main cities in Belgium in terms of population are Brussels, Antwerp, Ghent, Charleroi and Liège. Other notable cities include Bruges, Namur, Leuven, Mons and Mechelen. ^ Reuters (2016-11-29). "Belgium and Netherlands agree to swap land to simplify border". The Guardian. ISSN 0261-3077. Retrieved 2017-08-04. ^ "Centre géographique - Le Site" (in French). Municipality of Walhain. Archived from the original on January 18, 2010. Retrieved 2007-03-09. ^ Pearce, Fred (2003-03-05). "Sewage-laden Belgian water worst in world". New Scientist. Retrieved 2006-05-09. Wikimedia Commons has media related to Geography of Belgium.